An original oil painting by June Pauline Zent 18×24 inches. 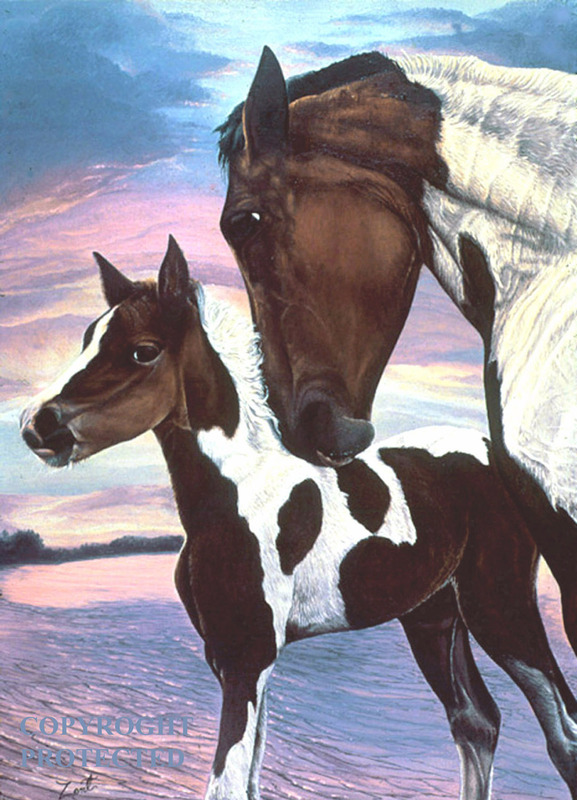 This painting features Burt Reynolds famous horse: Cat Dancing and her new-born Philly: Dancing. It was requested by Burt Reynolds and commissioned by Tammy Wynette as gift to him. I decided to make the background the Jupiter Inlet because it was one of his favorite places. The painting faces the West where his ranch was located. The next call from Buddy came from the set of a movie in California. ” I couldn’t come to see you; it would have been too hard to leave. But I will call often and I have left you in good hands.” His name was Bobby Collins: a lawyer in fort Lauderdale who was a long time friend.Buddy told a story about often visiting his friend’s home where a portrait of Bobby and his wife hung predominately He said that the work was so bad that the standing joke was for Buddy to remove the piece and hide it in a closet as soon as he entered without a word. I laughed. Then he asked me to replace it with one painted by me sometime in the future. ” He will help you market your artwork, help with your divorce, and his wife is a social worker so she will advise you about programs for Billy. I understood why he had left without a word and was grateful for all of his help. I also missed him terribly from that moment on. I called Mr. Collins making an appointment for the next week. He wanted me to bring a painting of a new-born bird sitting in a hand that Buddy had seen in my little apartment and all newspaper clippings of stories done about my artwork. At the appointment this man was not interested in anything except my relationship with Buddy. I was given the third degree about our childhood together and what our connection was now. I avoided his prying questions and left leaving a large packet of artist’s history along with advertisements about my work. My only thought was: This man was one of the vultures surrounding the man who I loved and feeding off of his celebrity. The next call from Buddy was in a hurried and excited voice. “Cat Dancing has given birth just now and it’s a filly. Grab your camara and get over there NOW!” They were waiting with the gate opened.Remember this was the horse that had tried to ram me on an earlier visit so I approached the corral very cautiously. There was a huge barn in the middle with hay and water and they were both standing still looking at me. The baby was a miniature of her mother with the same haughty look in her eyes. Cat Dancing snorted and pawed the ground, then she pushed her baby inside the correll out of sight. Opening the gate gingerly I scooted inside and immediately sat down on the ground.I wanted to show the new mother that I was humble and meaning no evil intent. About fifteen minutes later she emerged and walked to about five feet in front of me. I was getting prepared to climb the fence or run before getting mashed but she abruptly turned and walked back with her baby tagging along behind. WHEW! I have great respect for mothers of any kind and would not anger one in a heartbeat, especially one where I am only as tall as the bottom of her belly! But the baby was naïve and full of curiosity. she kept coming out and walking right up to me where I could have reached out and touched her. Again I expected to be trampled on but Cat Dancing just watched from a distance. I clicked away with the greatest pictures of the little one now named Dancing but I wanted to snap some shots of them together. So I carefully stood up and moved slowly toward the correll. That darn horse knew what I wanted and scooted the baby into the shadows every time I got near. Finally she let up a bit and I got enough good shots to study for a painting. The result is the oil painting above which Tammy Wynette purchased as a gift for Buddy. We had become quite good friends by then and she also wanted a portrait painted of her four girls. That was my next project and it turned out to take all of my will to complete as you will see in the next Continuing nine where I hope to see you here with me. This entry was posted in Original artwork by June Pauline Zent, The Story of I Promised You, True Stories About Artwork, Uncategorized and tagged art, artist, Burt Reynolds, celebrities, human intrest, love, painting, pets, Tammy Wynette. Bookmark the permalink. And I am so glad that you like the story. My self confidence is lacking when it comes to writing. Each time I write one I wonder if anyone will like it and am so gratful that you do! I am hoping that the story is intresting enough and the writing will be over looked. Ha ha So glad to see you here! Yes, Manu the very same Burt Reynolds movie star. We were kids together and beyond. You need to go to the stories and read beginning with I Promised You. Then there are eight stories numbered so you can read in sequence. If you liked this one you will like the others. Thank you for your compliments and for coming here! I am so glad that you liked the story Stefan. I do get all of your compliments and comments and I hope that you get mine. I always read your post so if you do not get a reply I need to find out why. Let me know and thank you so much for coming here! Ohhh man, I already had a weird feeling about Tammy and now looks like I might be right! I don’t think you need to worry about your writing too much because with a story like this, we all get too caught up in the plot to mind much about anything else. 🙂 Looking forward to part nine! Well, I will tell you that she was also in love with him as you will see but I loved her as a friend and she was one of the sweetest persons I knew. How astute of you to wonder how she fits into the story! You are a sensitive soul! and I love having you come here and comment. It is a complicated story and one that I have held inside for many years. Somehow telling it is freeing and having so many relate is a great bonus! My arms will welcome you and caress your mane.. I love the line “you are my replica” It describes her exactly and I am so honored that you wrote a poem about the painting. I will keep it forever! I am so please that you like the stories as well as the painting. You opinion means a lot to me. Thank you! Very nice picture, It’s spelled filly though when talking about baby girl horses rather than a sports team. Thanks again for the compliment and the correct spelling. I will change that! You are amazing, my sister. I love you sooooo much. You have been through so a lot in your life that made you the wonderful person you are. Thank you so much Subhan. Your comments help to inspire me and I am very happy to have you r support. If that’s the only typo that you have made you are a genius! I make them on a daily basis.Ha ha. What a gorgeous painting! Looks so alive. Thank you so much! what lovely compliments. Yes, they were very much alive when trying to get reference photos of them! Again thank you so much nightlake. I think that you see what I am trying to say and that does make me feel really good as well as you taking the time to comment!